SG-1 is still mourning the loss of Daniel Jackson when Freyr arrives at the SGC with word that Thor has been killed in a confrontation with the Goa'uld, and SG-1's help is needed to rescue an Asgard scientist. The team travels to the Adara system and is transported to an underground laboratory, where they meet Heimdall, an animated and amiable Asgard scientist whose research into Asgard genetics is vital to the future of the Asgard race. However, Heimdall insists that they cannot leave. Thor is not dead. 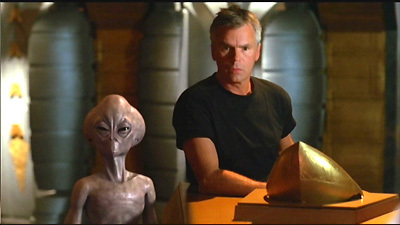 He is a prisoner of the Goa'uld aboard the mothership in orbit above the planet. O'Neill and Teal'c transport aboard the mothership to rescue Thor as Carter monitors their progress from the lab through holographic images. However, they are captured and detained in a holding cell, just as Anubis arrives to join his ally Osiris. Anubis has gained technology previously unknown to the Goa'uld, and he implants a device into Thor's brain that will download all information pertaining to Asgard technology directly into the ship's computers. However, through the mind link, Thor is able to override security and release O'Neill and Teal'c from their holding cell, and they prepare to disable the mothership's shields from within. Meanwhile, Osiris traces Carter's signal, and transports to Heimdall's lab, capturing her, and holding her in the grip of a ribbon device. As the mothership's shields are finally disabled, Heimdall safely transports Thor and all of SG-1 aboard the cargo ship. The cargo ship attempts to launch, but the Goa'uld fire upon it, rendering it defenseless, until three Asgard motherships suddenly appear. The Goa'uld retreat in the face of superior numbers, and SG-1 escapes. Anubis remains an ominous threat, however, as the three members of SG-1 retire for the evening, a whispering breeze suggests that they will not face it alone. The Asgard are a dying race. They reproduce exclusively through a process of enhanced cellular mitosis (cloning), and for nearly a thousand years have been physically incapable of achieving cell division through meiosis (sexual reproduction). As each Asgard痴 body fails, his consciousness is transferred into a newer, younger version of himself. Lack of genetic diversity has led to eventual deterioration during cloning, and a process of irreversible genetic manipulation through controlled mutation has helped to temporarily avoid complete genetic breakdown. About 30,000 years ago, a ship was launched from the Asgard homeworld with a crew placed in suspended animation. A failure in the navigational system caused the ship to drift between galaxies until it was discovered near the Adara system six months ago. Heimdall痴 research analyzes the physiology of a preserved crew member to find a way to prevent genetic degradation during reproduction through clone technology. Heimdall痴 lab is deep underground on the second planet in the Adara system, under the protection of the Protected Planets Treaty.